Hawila Project is the non-profit organisation owning Hawila. The main vision of the organisation is to engage and bridge coastal communities with transported local products by sail. Hawila Project aims to unite the transport of goods with an onboard educational platform to inform about the issues surrounding globalisation, and challenge the current food system culture. 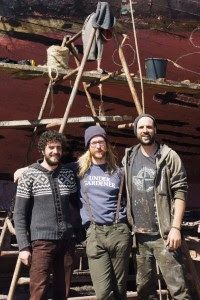 The organization is powered by volunteers and was launched in winter 2014 in order to maintain, renovate, and sail the Hawila. The organization overlaps different activities from the physical work needed to maintain and restore the vessel, to the organizations of events on board, as well as the establishment of collaboration with local and international organizations to develop projects that span from performing arts and education to green slow transport.